Sharon has also worked on important restoration projects over the years. Some notable projects have been Chicago’s oldest church St., Patrick's, the Second Presbyterian, All Saints Episcopal Church, St. Elisabeth's Episcopal Church in Glencoe among others. The Sharon has also worked with restoration architects such as Bauer and Latoza, restoring windows for a historic stone building at the Morton Arboretum. Another collaboration included Sharon recreating 44 stained glass windows for the historic kindergarten and sun room at the Helen C. Pierce school for the Chicago Board of Education plus restoring existing windows. 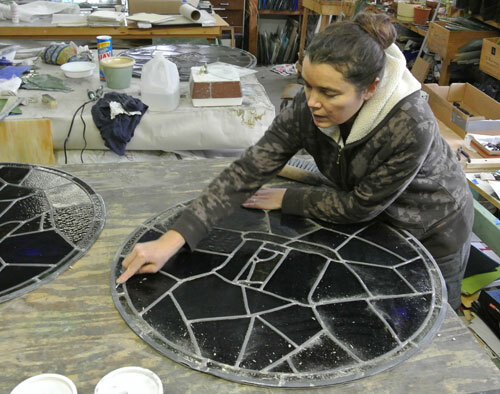 She has also recreated historic architectural details in cast glass and blown glass. She has restored Tiffany lamps and windows as well as a Burne-Jones window for a private collector. You can rest assured that your valuable antiques are in safe hands. Another skill set includes the ability to perform onsite restoration. Windows that are bowed or have numerous pieces or cracked glass and deteriorated metal are not candidates for this process. But windows that have only a few cracks and that could be quite difficult and expensive to remove lend themselves well to this kind of restoration. The slightly higher cost of onsite work is often completely offset when you consider the cost of deinstalling and reinstalling a window, especially if it is larger. Opal Glass can replace cracked pieces of bent or curved glass panels from Antique metal and glass light fixtures. Broken glass pieces that have been painted can also be re-created in the traditional manner.